The The Fijian Government’s prepara­tory efforts to host the 30th United Nations World Tourism Organisation (UNWTO) Joint Commission for East Asia and the Pacific (CAP) and Commission for South Asia (CSA) Meeting received a wel­coming boost. This is through the Ministry of Industry, Trade and Tourism (MITT) which received a donation of $50,000 from Carpenters Fiji Lim­ited and $20,000 from Vodafone respectively on Thursday May 3, 2018. Acknowledging the assistance the Minister responsible Faiyaz Siddiq Koya said that the ministry was truly indebted to the generous assistance and commitment shown by both organisations. “This is truly encouraging and I sincerely thank Carpenters Fiji Limited and Vodafone Fiji Limited for coming out and supporting us in hosting the 30th United Nations World Tourism Organisation (UNWTO) Joint Com­mission for East Asia and the Pacific (CAP) and Commission for South Asia (CSA) Meet­ing, in conjunction with the UNWTO Region­al Seminar,” Mr Koya said. Mr Koya added that Fiji won the bid to host this prestigious convention in Madrid, Spain and with the preparations well under way, Fiji would be the first Pacific Island country to host this event in the region. “With the Seminar’s theme on Climate Change, it goes well in line with our COP 23 Presidency. Therefore, this event is extremely important to us and we need all the support we can get in making this event a successful one. Government cannot always do this alone and having a Private-Public Partnership with stakeholders, bring out the best of what our country can offer,” Mr Koya said. Vodafone Fiji Limited regional chief ex­ecutive officer Pradeep Lal said that with the tourism industry being the country’s largest foreign exchange earner and a sig­nificant contributor to the Fijian economy, it is critical that the industry receives support in forming a stronger platform for growth in achieving the Tourism 2021 (Plan). “The Government’s development plan of achieving a FJ$2.2 billion industry by the end of 2021, will in turn have many positive socio­economic impacts across the country. There­fore, today we extend our support for the 30th Joint meeting of the UNWTO Commission for Asia and the Pacific. It is indeed a great achievement for Fiji Tourism and kudos to all tourism stake­holders as their ceaseless efforts have laid strong foundation for our tourism industry to thrive,” said Mr Lal. 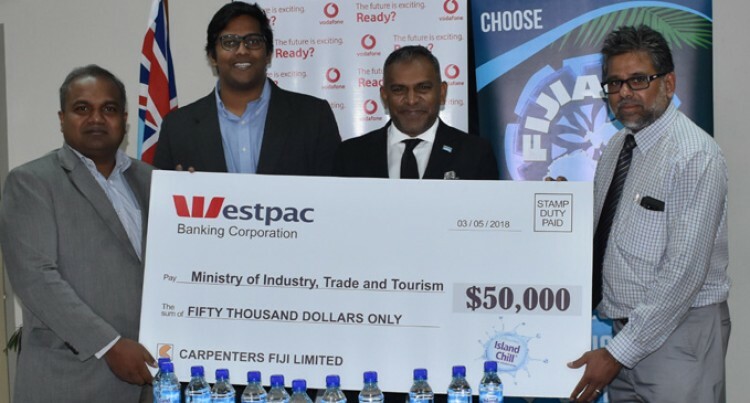 Carpenters Fiji Retail and Marketing direc­tor Sabaratnam Kunasaleen said they were happy to be part of such an event and Carpen­ters will always be at the forefront to support the development of Fiji’s tourism industry. “Our tourism industry plays a critical role in the overall development of our nation and ensuring that the industry does develop in a sustainable manner, is just as important. Therefore, supporting an event that would bring together tourism stakeholders from the Asian/Pacific Region who would delib­erate on opportunities for sustainable tour­ism development, is something Carpenters Fiji stands ready to support,” said Mr Kuna­saleen. The meeting is scheduled from 18 to 20 of June at the Sheraton Fiji Resort and Spa in Nadi. Delegates attending the event include Minis­ters of Tourism, senior Government officials, industry practitioners and tourism experts from countries such as China, Korea, Japan, Malaysia, Thailand, Vietnam, Bangladesh, Maldives, Pakistan and India, among others.